The modern entertainment industry -- never mind the culture of celebrity with which it is intertwined -- owes a profound debt to Barnum’s innovations a century and a half ago. He understood, far better than his contemporaries, how to attract an audience, and no less important, how to keep it. In fact, the professions of advertising, public relations, marketing, and all the other means and methods used to persuade twenty-first century consumers what to buy, where to eat, what to watch, and how to live arguably trace their origins to Barnum. Stephen Mihm’s new book situates Barnum’s contributions within the larger issues of his lifetime, including the vexed issue of race, slavery, and abolition. The particular version of his memoirs used in this volume is drawn from the original 1855 edition. Unlike subsequent versions, where Barnum banished some of the more disquieting stories and events of his life, the original edition offers the most unvarnished account of Barnum's career up until that time. In addition to Barnum’s life story, this edition reprints fourteen additional documents to bring Barnum’s entire career to life. 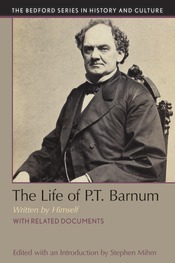 These documents include reviews of the autobiography in the popular press; selections from Barnum's other writings; and a handful of other items selected to illuminate parts of his life not captured by the autobiography itself. Following the documents there is a chronology, questions for consideration, and a selected bibliography to encourage further analysis and research.